This entry was posted in General posts about Maintenance & Reliability and tagged Business, Condition monitoring, Failure, Failure causes, Maintenance, Maintenance Management, Planned maintenance, Process safety, Reliability engineering, Root cause, Safety, Technology by Bjarni Ellert Ísleifsson. Bookmark the permalink. I ask for you permission to do it. You are welcome to, I will send you a E-mail for further details. I’m glad you brought this up. We have learned that the way to gain upper management support for pro-active maintenance budgets and the funds for the needed training and certifications is to speak the same language as the upper level managers….money…..bottom line profit. What a simple tie-in an enhanced culture of safety can be at this time. Modern lubricant storage rooms and modern oil transfer tools are safe because there is no more greasy floors to slip on. Every location where automatic lube machinery is used becomes more profitable and efficient due to no wasted lubricants, less labor costs, less parts and downtime plus one of my favorites, a human asset may avoid the peril of lubricating a machine with dangerous moving parts and possibly from a precarious position. Besides the benefits of eliminating a source of injury or death we are holding back rising insurance costs. We all know how much the insurance companies dictate to our companies and the costs to comply and cover premiums. Every improvement in safety is an improvement in the bottom line. Hi Bjarni, I would like to translate this post into Polish to share it with the readers of Maintenance Magazine im Poland. I’d like to add my own comments to your’s. I’d like ask you for your permission to do it. Could you please contact me directly through E-mail? I would probably give you the permission but would like to review before publishing and provided I will be referenced properly etc. Hi Bjarni, GREAT article! I try and teach this to all our customers. Some grab on right away others are very slow to change. Any time you can increase the reliability and safety one should seriously consider it. I would like to forward this to all my customers with your permission. You are welcome to provided you give me full credit and reference this Blog site. Thank you Pernell and glad you liked it. A safe plant is a reliable plant, and vice versa. Tangible steps to the achievement of both safety and reliability are linked to learning. This learning cannot be sporadic, or superficial; it must be highly structured and must embrace both theory and practice. It culminates in the acquisition of in-depth knowledge which, when applied, is called wisdom. That requires years of mentoring and observing. It mandates understanding the difference between opinion and facts. Only a mature person will consistently act on facts. And only a highly principled manager will groom, and nurture, and reward, a mature professional. Not all managers are willing to tolerate and reward a mature professional when they, the managers, are accustomed to taking serious risks. What a great comment Heinz. Thank you for sharing your Wisdom with us! Very good article Bjarni and so true. We have been starting a new plant the past 6 years and probably we could lay our numbers over your graphs and they would fit well. I agree that reliability is one of the drivers for increased safety but can not pull the wagon alone. In our case Human Performance is the other factor that has been driving improved safety but both are vital. As manager responisble for both production and execution of PDM and PM I have learned one important thing and that is that if you are going to do PDM and PM well it needs to be well prepared and thought of when you are designing the plant. Otherwise implementation and result will be affected. We are of the same opinion in this regard. The challenge is achieving the perfect balance, nurturing the culture you need to achieve a truly great safety performance as well as reliability. I thank you for the comment and when you are in Toronto please don’t be a stranger, Jenny gives her regards and please say hi from both of us to the great team we both miss at your plant. Thank you for your comment and I wish you great success in your culture change for increased reliability and safety. Safety and reliabiliry are different entities eventhough it goes with hand in hand , most of the time. 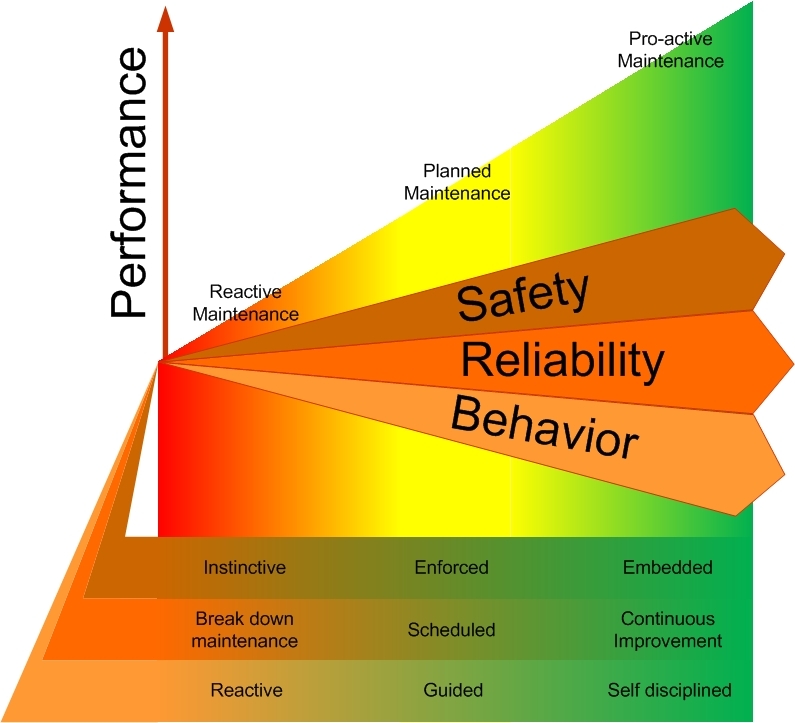 Fundamental fact is reliability is the bottom line for the organization to achieve the rest of the milestone like safety, yield, efficiency, profit margin etc..In other words if we need to achieve good maintenance index , safe design , reduced downtime ,all we need is reliable asset.This is the reason many organization goals says reliabililty as one of the topmost priority ss its directly linked to profit. Note- reliability which was meant is not only on assets, but on operation as well as human. •	When starting a new project analyzing and implementing reliability centered maintenance, we always start with a priority analyzes to determine where to start. Naturally, safety and statutory requirement always have the highest priority. Doing this is important to make sure that nothing bad will happen during the sometimes year(s) long process. This will also get top management support. •	The real issue about safety versus reliability becomes of great concern when we deal with hidden failures. Interlocks and pressure valves (just to name 2 examples) protect not only the equipment but often also human life. Here we must make a consciences decision how to detect hidden failures, how often to check proper functionality. This can get really expensive. In one steel mill checking for certain safety equipment required to interrupt the process. How much are we willing to “risk”? Failure of safety equipment can cause great tragedies like the BP Texas City refinery in March 2005 were 15 workers were killed and 170 were injured. Great points Jörg, thank you for sharing. Enjoyed your article. There are four key items that impact both reliability and safety: Operating Discipline, Robust Processes, Awareness, and Continuous Improvement. For years reliability professionals have made the link between reliability and safety. Although it may seem intuitive for some of us, I have not seen any statistical analysis that validates the correlation. Are you aware of any published data? Thank you for your comment and I am glad you enjoyed the article. No, unfortunately I have not seen any data that has been published but have seen a internal study for a company, based on their own data, that supports this. Maybe you should do a study internally with your company to see if this is the case in your company? If there are any Asset Management issues you would like my assistance on you are welcome to contact me. Great article Bjarni, I also reiterate the statement made by Jorg, “hidden failures” and operator discipline and culture. I have personally seen the devastation that occurred from operator hidden, bearing trips and failures. The self destruction of a high speed centrifuge that could have killed or seriously injured anyone who was in the building adjacent to the machine. Linking the initial risk evaluation of an asset and the implementation of the condition monitoring strategy to the asset is the starting point. Continual condition monitoring (strategy for this would be dependant on risk and impact level defined for the asset). Online condition monitoring is one such strategy that removes the operator/maintainer perception, inconsistencies and culture. The advances in modern technology being such that this can be done from the most remote of locations (one could say that risk is significantly reduced by the remoteness, maybe not!). The combination of true data (online monitoring for high risk and impact assets), with initial risk evaluation could effectively be used to plot the starting point on a graph or curve, and events from then could be directly correlated to a change on the curve in real time events. 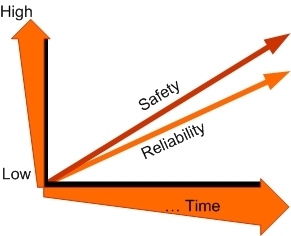 If the culture of the organisations management is to directly evaluate the increased likelihood of a safety event based on the number of real monitored trip events, the organisation could be considered to be continually monitoring the ‘safe’ performance of its plant via its reliability. Sorry if this seems obvious, but looking at your plots/graphs has brought about a slight change to my thinking and approach to organisation management change and buy in. Great stuff, can I use some of the images/graphics in presentations I do to clients about organisation asset management strategy? I will of course reference your blog site and anything else you wish me too. Do you have any case studies you can share? Great comments and thoughts. Thank you for sharing. You are welcome to use the graphics and text as long as you reference me and my site in a obvious way. Unfortunately the case studies I have seen are in-house studies and proprietary so I can not share them, I have heard that someone is working on a PHd researching this and I hope that it will be published. The Asset Management society would benefit greatly on more research being published in my opinion. You are welcome to share it with references. Thank you for your positive feedback Ramesh.